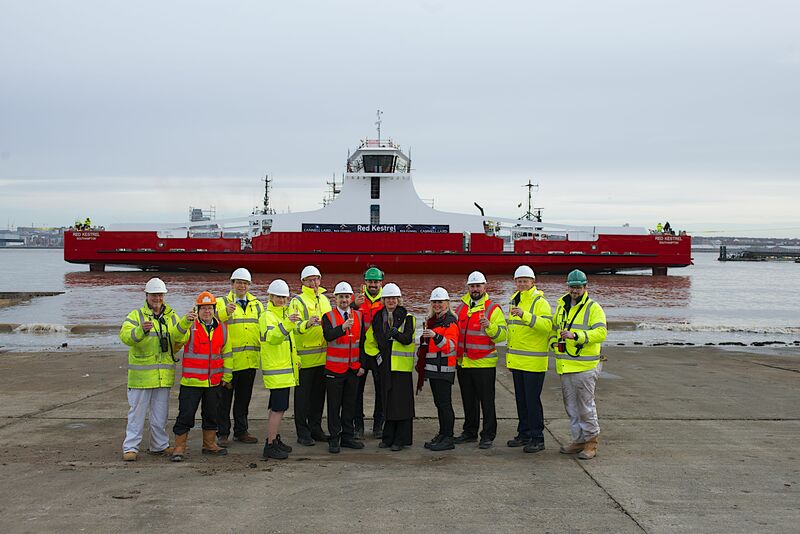 20 Feb, 2019 — In Birkenhead today the latest vessel for the fleet of Red Funnel, the original Isle of Wight ferry provider, was launched. Red Kestrel, a new freight-only RoRo vessel, will operate between Southampton and Isle of Wight. The vessel will officially join the fleet on arrival in Southampton, and enter service in May, following a trials and training period. The launch event, marks the debut of Red Funnel's first dedicated RoRo freight ship since the company’s inception almost 200 years ago. Red Kestrelis Red Funnel’s first ship to be designed for freight traffic. As a freight vessel she is limited to 12 passengers and constructed specifically to provide additional year-round freight capacity for Red Funnel’s Southampton-East Cowes route, which currently handles 53% of all freight movements across the Solent. Red Kestrel is due to enter service in May 2019, with the current ferry timetable to be updated to accommodate the vessel. Red Funnel is the original Isle of Wight ferry company with roots tracing back to 1820. Based in the UK port of Southampton, Red Funnel carries 2.3m passengers and over 800,000 vehicles on its ferry route between the UK port of Southampton and East Cowes and 1.1m passengers between Southampton and West Cowes on its Red Jet Hi-Speed service. In addition to ferry travel, Red Funnel is the only cross-Solent operator to offer ferry inclusive bonded holiday accommodation, attraction tickets, festival and event tickets and activity packages. Sub-brands include ‘Red Jet’ (the Hi-Speed passenger only ferry service serving West Cowes) and two food & beverage brands, ‘Steam Coffee Company’ and ‘ReFuel’. The Company is a founder member of Visit Isle of Wight Ltd, the Island’s not for profit destination management organisation and Red Funnel sponsors or supports most of the Island’s premier events including the IW Festival, Cowes Week, Isle of Arts, The Red Funnel IW Literary Festival, IW Newport Jazz Festival, Isle Walk Festival, Ventnor Fringe Festival and Wolverton Manor Garden Show as well as a range of community and niche interest events. Red Funnel’s 2019 Charity of the Year is Mountbatten Hospice, Isle of Wight.